You say tomato, I say “IT’S TOMA-TOH SEASON!” Our farmer’s markets are being invaded by these delicious gems of all varieties – the best of which being the heirlooms. Heirloom tomatoes, according to my dad and Wikipedia, are non-hybrid tomatoes, meaning they haven’t been genetically altered to withstand weather, transportation, insects, and Papa John’s pizza sauce makers. Not that I have anything against genetically mutated tomatoes – they’re the only ones you can find when you’re craving a tomato salad in January – but the O.G. heirlooms, though much more delicate, are riper, fresher, and have a ton more flavor. Buy them fresh and eat them quickly because they will spoil quickly (side-affects of not being a hybrid). 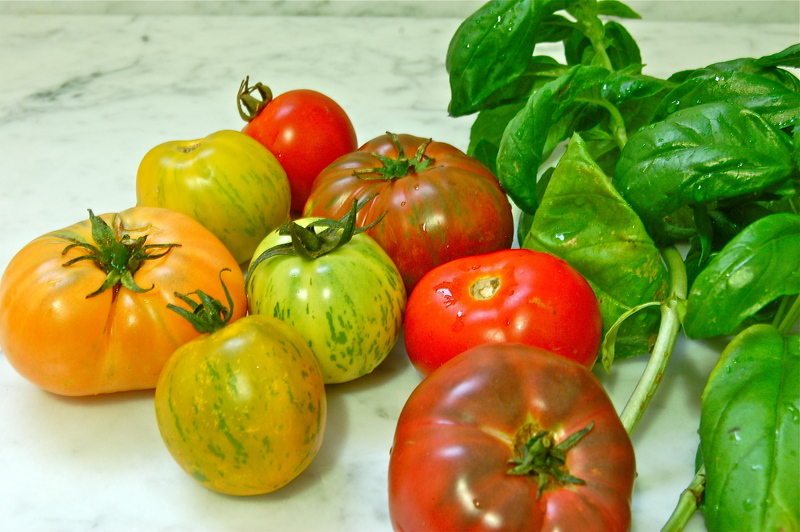 The season for heirlooms are the peak of summer time, which coincides with San Francisco’s foggiest, coldest weather. So for this reason I picked up some heirlooms at the Fort Mason Farmer’s Market and made what any rational San Franciscan would make in August: hot, roasted tomato soup. Since tomatoes are the key ingredient in this recipe, make sure you buy the best you can find. I recommend heirloom tomatoes in all different varieties from local farmers for a rich, ripe tomato soup. 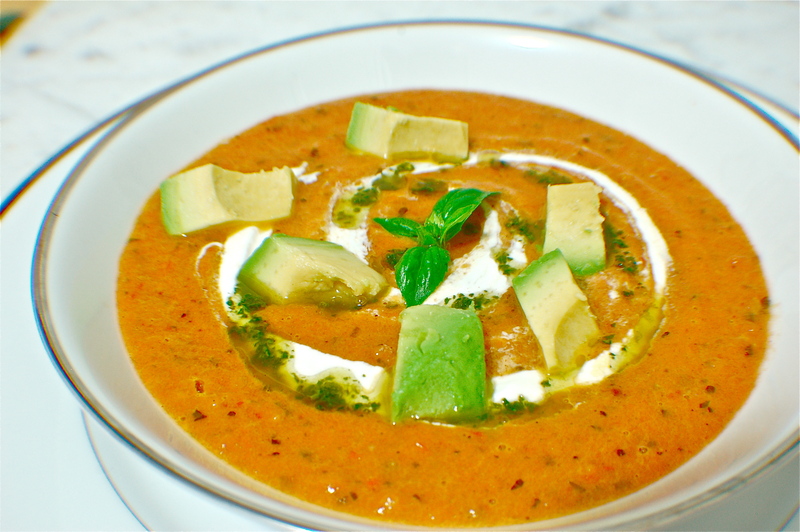 The soup is made a touch spicy with a thai pepper and topped with avocado, basil olive oil and greek yogurt. It’s fresh, fast, and oh-so-tasty. Say tomato, tomato-oh and let’s get roasting! Note 1: The basil olive oil for this recipe can be kept for about a month and used in multiple ways: drizzle on grilled bread, in scrambled eggs, finishing sauce for grilled fish, and over fresh greens. Note 2:The recipe can be made vegetarian by subbing chicken stock with vegetable stock. Set the oven to 400 degrees. 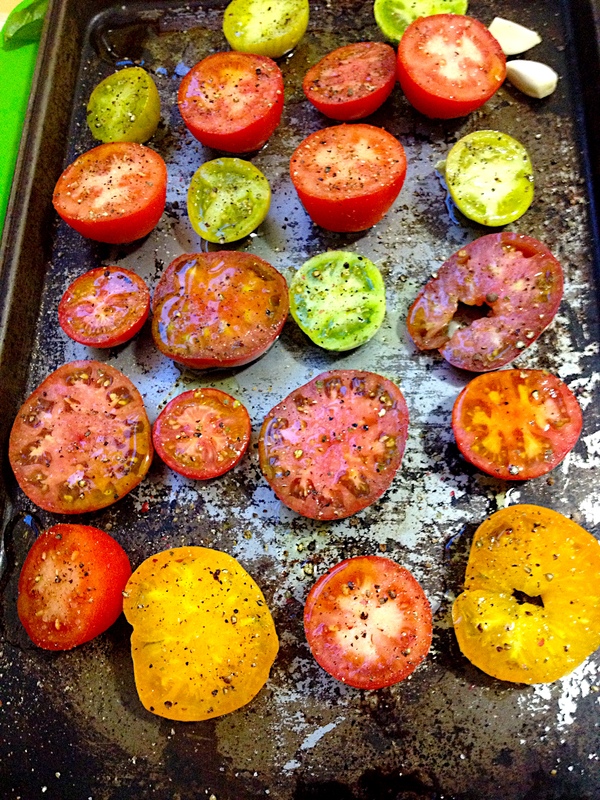 Slice tomatoes in half, removing any imperfections and stems. 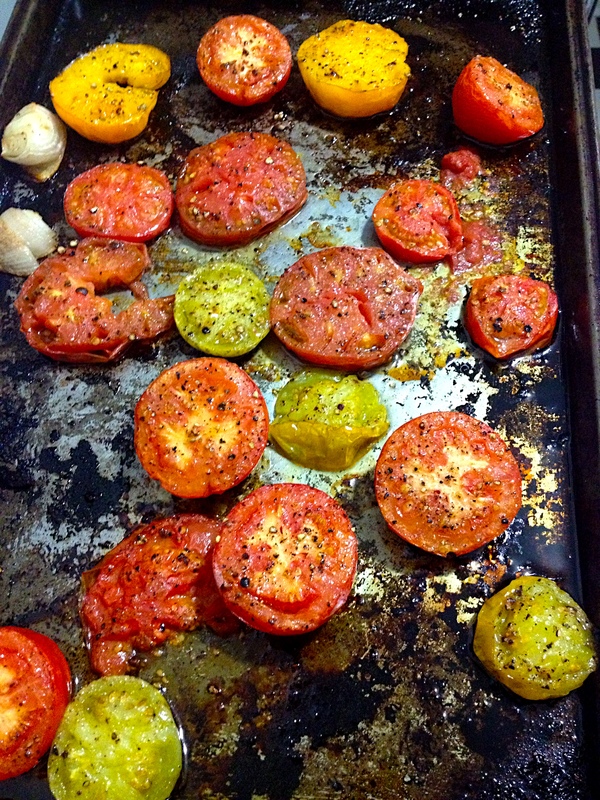 Place on a baking sheet and drizzle tomatoes, garlic, thai chili and shallot with olive oil. Sprinkle generously with salt & pepper and roast in the oven for about 15-20 minutes. Note that your oven will likely smoke a bit using olive oil as olive oil has a low smoking point. We could solve your oven’s smoking problem by using a higher smoking point oil like vegetable or grape seed, but the taste of olive oil is super important in this recipe. Instead of solving the smoking problem, open your oven a few times during the process and open a window or back door. Since we’re super efficient human beings, we’re going to make some basil olive oil while those tomatoes are roasting. It’s simple. 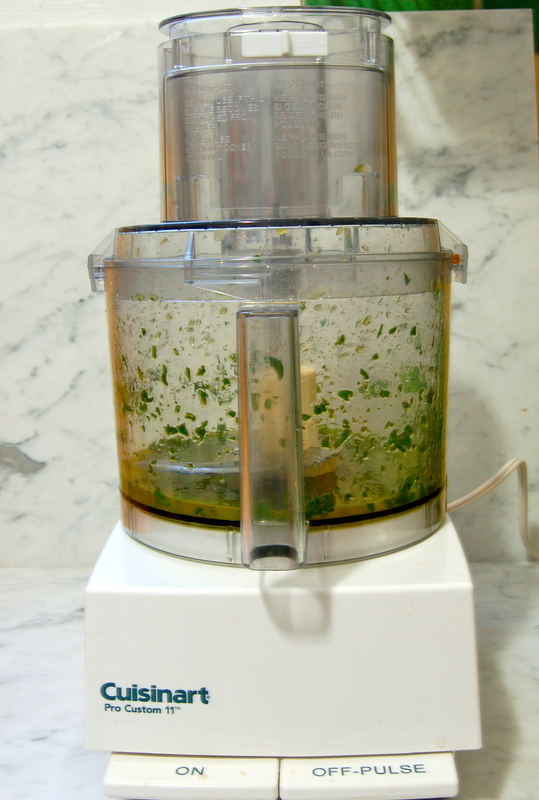 Put olive oil in food processor, add a large handful of basil (equates to about 1/2c), puree and then add S&P to taste. Whee. Set the basil olive oil aside, but don’t wash the food processor because (a) all those ingredients are in the soup anyway and (b) too lazy. 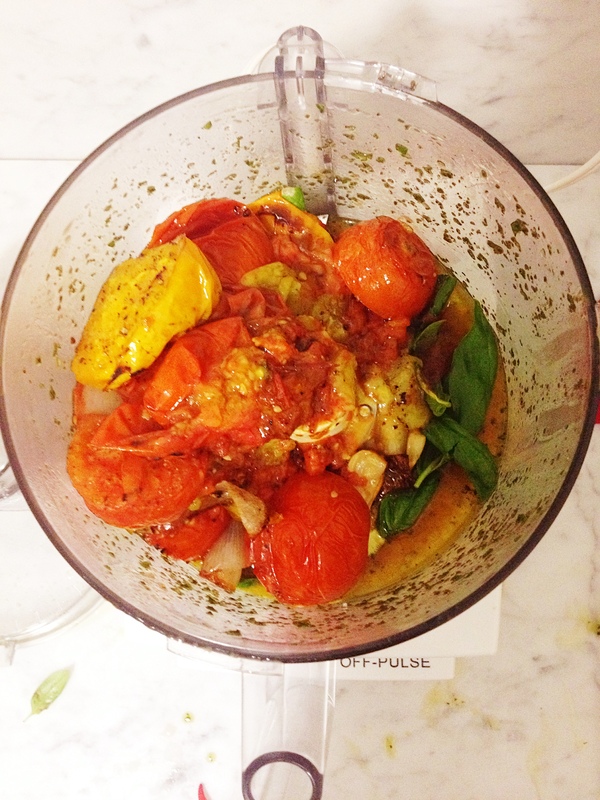 Place all of the roasted things (tomatoes, garlic, shallot, thai chili pepper) in the food processor. Add the smaller handful of basil and chicken stock. Puree until you have your desired consistency. This soup can be served cold or heated gently on the stove-top. I prefer warm as the slightly spicy soup is “cooled” by the delicious toppings. 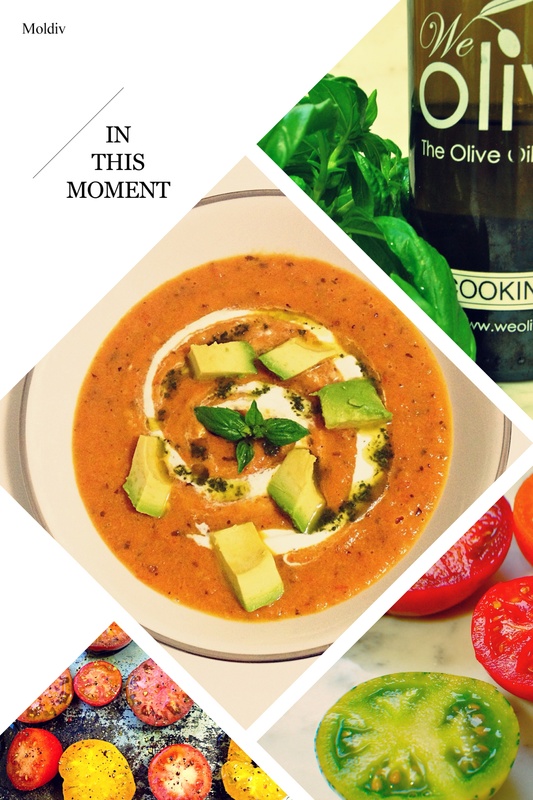 So top the soup with avocado, drizzled olive oil and greek yogurt, and say tomato-yummo! 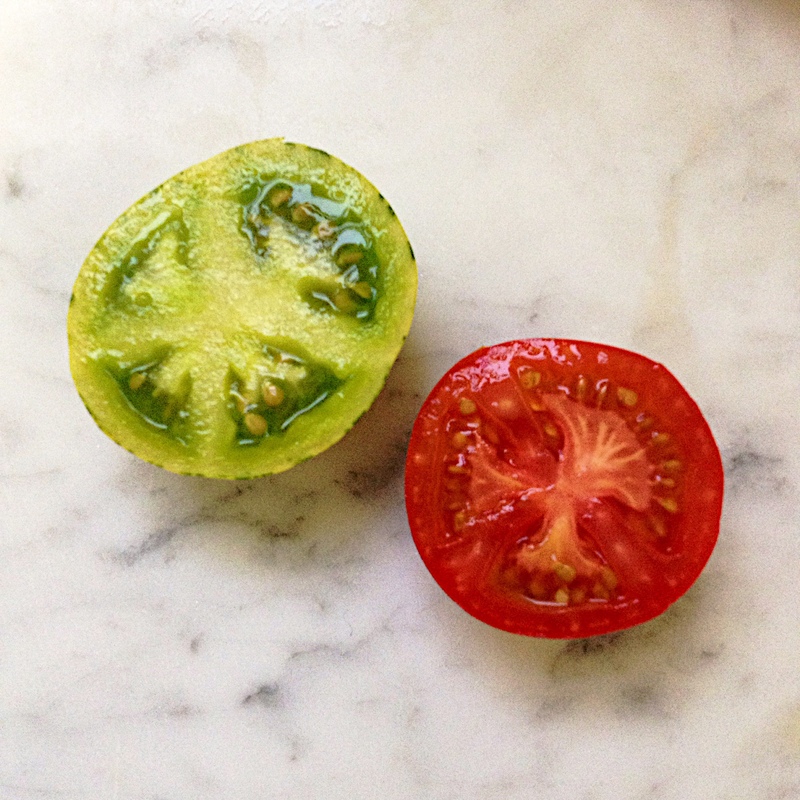 I went to a tomato taste and learned the difference between heirloom and hybrid tomatoes. Hybrids are not necessarily bad tasting. The ones at the grocery store are because they are bred for disease resistance and shipping. Hybrids for home gardening can be very good tasting. They are bred for disease resistance, which I love, but not for shipping. From now on, I will probably grow my own tomatoes or buy them at a local farmers market. Thank you for the additional info, Patricia! Your own tomatoes will be perfect for this recipe as you can pick them at your freshest – they will be so tasty! Let me know how it tastes with home grown tomatoes.